China's celebration of the New Year often invokes an animal - the year of the Rabbit begins on February 14, 2012 - that is attributed to the annual period, but on January 1, 1985 the mythic Kings on White Elephant stamp was issued on the world's New Year. The stamp's beautiful display of an ardent world myth encompasses Indra, or Pinyan in China, and is just one of the innumerable historic pieces that are featured on Colnect in the rare collectibles database. Indran is the God of Weather and War, and is widely considered the King of Gods, or at least of demi-gods, in China, Asia and Europe. The gorgeous stamp is rich in color and detail and features worshipers and kings riding the back of the great Indo-European entity. Indra, who is a symbol of power, is depicted as an enormous white elephant complete with tusks and regal dressings that adorn a head and a boat-like object seating the people on its back. The White Elephant stamp emerged in China on New Years day twenty-seven years ago, and is surely an excellent rarity to collect if you enjoy bringing a little history into the New Year. The Colnect Catalogs have a vast array of historic treasures waiting to be found. This December, on Christmas, marks the 88th anniversary of the Coca-Cola re-patent, through which Coke stamped December 25 on the Classic glass vessels that were later dubbed the “Christmas Coke" bottles by many avid collectors of Coca-Cola memorabilia and their Classic Coke bottle caps. At Colnect there is a beautiful array of the Coca-Cola Classic bottle caps amongst our vast catalog of rare collectibles. The story of Coke’s infamous dated bottles bolstered the company’s sales and forever linked them closely with the holiday, as many Coca-Cola Christmas advertisements began, and they have continued on for decades in the US and around the world. The Classic red and silver cap design, in particular, became Coke’s biggest thematic element, as the flowing script amongst the classic, sleek, and yet always modern red, white,and silver cast the soda company into a collector’s Americana category. And this remarkable look has appeared in the majority of Coke’s marketing, as well as in their holiday advertising because the red and white coke elements work wonderfully with any Christmas aesthetic. The ribbed hobble skirt design for the glass Coke bottles was agreed upon, as was the metal bottle caps (rubber stoppers had been used in prior years), and the company re-patented this, receiving a December 25, 1923 date for it. The Classic Coca-Cola “Christmas Coke" bottles were then stamped with this date for years to come. The Classic Coke bottle caps are extremely collectible and showcase a design that has become a legend over its near one hundred years in existence. These bottle caps are an inspiring and featured member of the Colnect bottle cap catalog that is well worth visiting. We're pleased to announce that we've now deployed new server for Colnect. These machines are MUCH FASTER than what we've been using before. Hopefully, you will all feel the speed improvement. The other important thing is that Colnect will now be able to properly handle the surge in traffic. As more and more collectors join Colnect, it's becoming more and more a bountiful resource for all collectors around the world. You're naturally most welcome to invite all your collector friends to join us. Colnect is currently implementing a system for rating the rarity of actual items featured by attributed collectors on the site. Rarity Scores would harness the ability to determine just how rare an item actually is amidst the expert Colnect collectors. This score stands to weigh the Colnect inventory of collectors who have said items against how many are also seeking them. In this way, the more common items would appear as such, with appropriate values given them. Should the Score take into account the fact that a particular item's condition is listed as Mint or as Used? A feature like this could differentiate the rarest of the rare. Should the credibility of the Collectors that are on Colnect be a factor? New Colnect users should almost certainly have to be marked as such, as current users get great feedback for their work, trading, and collections over time. Colnect already features an intuitive Collector Ratings system, so that collectors are proven by their activity and collection sharing to be honest and upstanding. One of the goals of the Rarity Score at Colnect is to provide collectors with a go-to reference guide that can help place value on collectibles. Colnect's adept use of Collector Ratings, the way that Collectibles are featured, and the way in which desired items are placed in a Wish List and collectors' items that are available are placed in a Swap category already makes for an extremely useful guide, while continuing to connect the world's brilliant collectors and their collections in the ultimate networking experience. The Rarity Score can greatly bolster Colnect. Anyone that has any input or suggestions as to how Colnect can make the transition from the already well organized catalog system to one that is also including Rarity Scores would be appreciated. There is an ongoing forum on the Rarity here. On this day in 1773, a group of colonists from Massachusetts who were disguised as Mohawk Indians boarded and raided three British tea ships at the Boston Harbour and proceeded to dump 342 chests of tea into the harbour. This was popularly known as "The Boston Tea Party". This midnight raid was in protest of the British Parliament's Tea Act of 1773, which was favouring the East India Company by lowering its tea tax and granting it monopoly of the American tea trade. As soon as the three ships known as the Dartmouth, the Elanor, and the Beaver, arrived at Boston Harbour carrying the tea, the colonists were outraged and demanded that it be returned to England. This request was refused by the Massachusetts Governor, Thomas Hutchinson and as revenge Samuel Adams, the Patriot leader organised the "tea party". About 60 members of the Sons of Liberty resistance group dumped $18,000 worth of tea into the Boston Harbour on the night of 16 December 1773. The Boston Tea Party was an important event in the growth of the American Revolution. Parliament responded to the destruction of British property by implementing Coercive Acts which also resulted in the closure of Boston's commerce until such time that the British East India Company were reimbursed their losses. This resulted in more protest actions by the colonists and the crises escalated resulting in the start of the American Revolutionary War in 1775. Norwegian Roald Amundsen became the first explorer to reach the South Pole by beating his British rival, Robert Falcon Scott. Roald Amundsen born in Borge, near Oslo - Norway, in 1872. He was one of the heroes in polar exploration. Amundsen planned to be the first man to reach the North Pole, and was about to embark on his mission in 1909 when he was informed that the American Robert Peary had already achieved the feat. He instead sailed for Antarctica in June 1910, where Robert F. Scott, the English explorer was also headed with the same aim of reaching the South Pole. Amundsen sailed his ship into Antarctica's Bay of Whales early in 1911 where he set up his base camp closer to the pole than Scott. Both explorers set off in October – Amundsen used sleigh dogs while Scott used Siberian motor sledges, Siberian ponies, and dogs. Amundsen's expedition won the race to the South Pole on 14 December 1911 and he returned safely to base camp in late January. Scott's expedition was marred by misfortunate. His team reached the pole on 18 January 1912 only to find that Amundsen had preceded them by over a month. Amundsen established a successful shipping business after his historic Antarctic journey. He later made attempts to become the first explorer to fly over the North Pole. In 1925 he flew within 150 miles of the goal, but in1926 he succeeded and he passed over the North Pole in a dirigible just three days after American explorer Richard E. Byrd had apparently done so in an aircraft. A diary that Byrd had kept on the flight was however found in 1996 that suggested that the he had to turn back 150 miles short of his goal due to an oil leak. This thus confirms that Amundsen's dirigible expedition was in fact the first flight over the North Pole. Amundsen disappeared on June 18, 1928 while trying to rescue a fellow explorer whose new airship Italia had crashed at sea near Spitsbergen, Norway while returning from the North Pole. It is believed that the plane Amundsen was in crashed in fog in the Barents Sea, and that he was killed in the crash, or died shortly afterwards. His body was never found. Russia issued a silver coin in 1995 in their Expedition & Exploration series to honor this great man. On this pivotal day in 1993,the Republic of Armenia officially cut its last and most important link to the Soviet Union by adopting the “Dram” banknote as its official currency. This week marks the eighteen-year anniversary of the memorable event that began the Republic of Armenia’s economic independence with the release of the intricately exquisite “Dram”banknotes. Colnect features these rarecollectibles in all of their glory. These historic documents come out of a unique country that borders Turkey and is located at a crossroads of three important regions, as the Middle East, Eastern Europe, and Western Asia come together around its lands. The Republic of Armenia’s “Dram” is not just a symbol for the fall of the Soviet Union, but is more one for their newly emerged national identity. Of the first banknotes to beput into circulation in the Republic of Armenia, there were eight denominations: ten, twenty-five, fifty,one hundred, two hundred, five hundred, one thousand, and five thousand “Dram”. 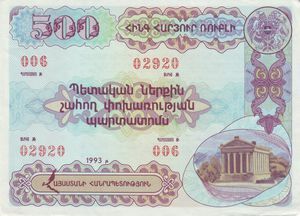 An example of a 500 note is pictured here and shows the gorgeous blue, violet, and green color scheme interlaced with woven designs and a classic Armenian colonnade. It is an inspiring design and a featured member of the Colnect banknote catalog that is worth remembering. 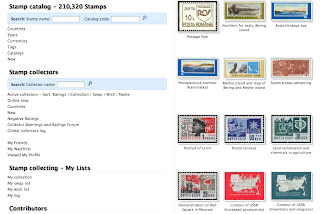 November 2011 marks a new landmark for Colnect; in just under ten months, the world’s “best stamp catalog” has bolstered its masterful stamp collection from 150,000 to more than 210,000 unique stamps! In fact, Colnect, its members, and the Frognector have added a massive 10,000 unique stamps to the archive in the last month alone. Colnect Stamp Coordinator Klaus Jochimsen [Lola22] has done an amazing job managing and boosting this premier stamp catalog to amazing renown. Colnect stands apart in terms of managing and expanding collections across the globe. Nowhere else can members upload their collections, categorize them, and vie with potential traders, sellers, and buyers for whatever strikes their heart, including the rarest of rarities: the “circuit of space flight to moon, 1966 Russia” stamp. 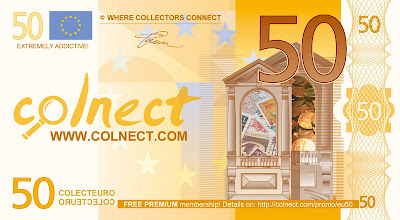 The connections that people make through Colnect has culminated in the continued growth for collectors of all types, and each new member is helping to add their own personal touch, and stamps of course, to the myriad amount of stamps, teabags, coins, bankcards, beer coasters and more that are showcased on Colnect. 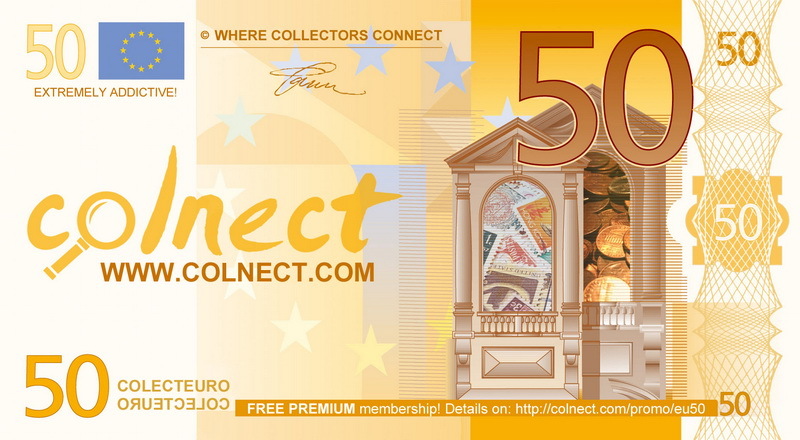 Colnect features an intuitive use of translation software that allows its members to easily communicate with fellow collectors in fifty-eight languages. This is why serious collectors of all ages, creeds, countries, and interests use Colnect to manage their own personal stockpiled passions. There is a lot of fun to be had on Colnect. 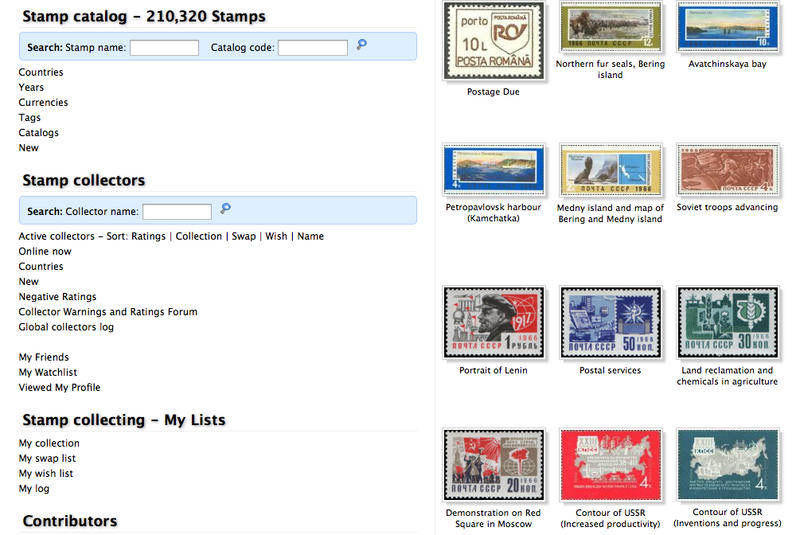 Please peruse the incredible stamp collection and scour the site for anything that moves the collector in you. Get connected and Colnected, and keep collecting! Thisweek marks the twenty-two year anniversary of the four gorgeous “Moon Rover UPUCongress Futuristic Mail Delivery” stampdesigns that were released on November 28, 1989. Theywere issued at the first ever Congress of the Universal Postal Union that washeld and also at the World Stamp Expo ’89. These are true collector’s items that can be foundon Colnect. Atthe close of the Cold War, the space race still loomed large in people’s minds,and the possibilities for future universal travel, living in space, and yes,even mail delivery, seemed infinite. TheMoon Rover stampswere born at a time when anything concerning space travel was not onlypossible, it was probable, and in the near future too. TheMoon Rover stamps are vivid, detailed, and colorful as they depict a scene fromthe future: mail delivery on the moon. Such lunar delivery might be outof the USPS, UPS, and FedEx range for the moment, but the science-fiction-likestamps are certainly inspirational. Inthe pictured 45 Cent (US) stamp, the earth can be seen in a lustrous bluespherical form in the background, as the lunar rover treads gray, mountainousterrain of the moon. Its satellite dish and driver peer over the surface,probably scouring the distant horizon for any mailboxes incognito. The Americanflag covers the front of the vehicle, and the packages and parcels of many aMartian of Earth traveler line the back. 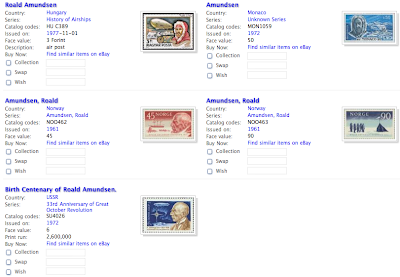 Thefour stamp designs were printed in souvenir sheets and also individually inse-tenant – which means that the four different types were sold together. Thestamp set’s philatelic information is as follows: Minkus Number A125;denomination 45c; Perforation type 11; Intaglio & offset color printmethod. Manyof the items that collectors on Colnect collect are in fact associated withcertain historical events that have taken place over time. This appliesespecially to Stamps, Phone Cards, Coins and Banknotes. To commemorate thesespecial historical events, countries release special issues of these items thatdepict images and information relevant to these events. Throughour “Today in History Through Collectibles” Blog we will highlight specialevents in history by featuring Collectible items from our Colnect Catalogs that areassociated with historical events that took place on specific days in history. On all pages of our forum and private messages system, there now is a translation button. Click it to get an automated translation of the entire page you see. Colnect is available is 58 languages. Translations on Colnect are maintained by volunteers. They do a fantastic job but they cannot translate our forums and your private message. The automated translations will not be as good as the manual ones but they should be good enough to help you understand simple messages. NOTE: Mistakes do happen with automatic translation. Use simple sentences and try to repeat the meaning of what you want more than once. This will help ensure that the meaning of what you wanted is understood. So no, we're not building a new Tower of Babel but we're now making it much easier for you to communicate with collectors from all around the world. It's now easier to make friends in more countries with Colnect. 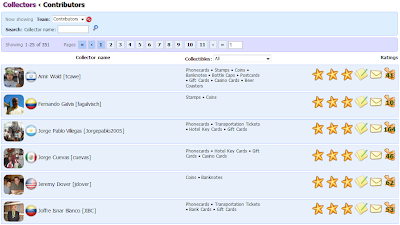 This integration has been done directly in our phpBB forum system and the same concept can easily be applied to forums all around the Internet who would like to use it. If you run such a forum, we'll be happy to help you implement this addition. The collector with most positive ratings on Colnect, Mr. Ernesto Berrios, has just the mark of 313+ positive ratings. This achievement is even more incredible when you realize Venezuela has had a fair share of problems with its postal system as we previously reported. When and how did you start your collection? I began my collection during 1987-1988. I started it because magnetic phone cards of various values and colors were issued in Venezuela and, as I found them very interesting, I decided to save them. 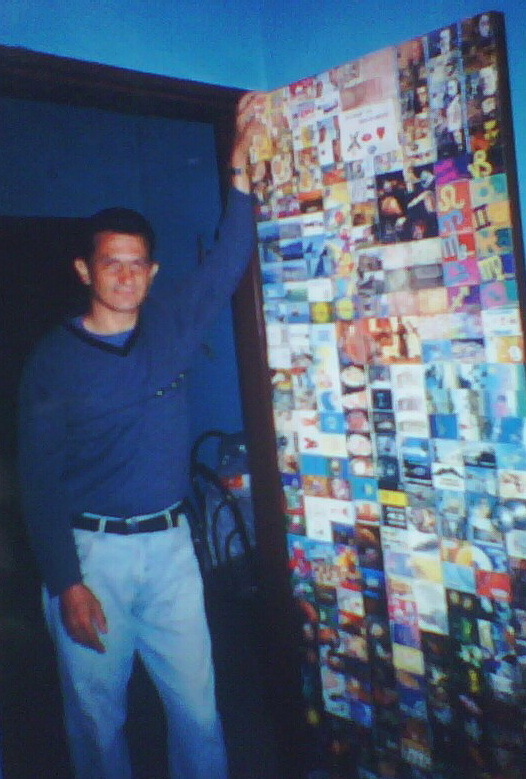 Later I got to know a few friends from Europe, such as from Spain and France, that traveled to Venezuela and I asked them for phone cards. 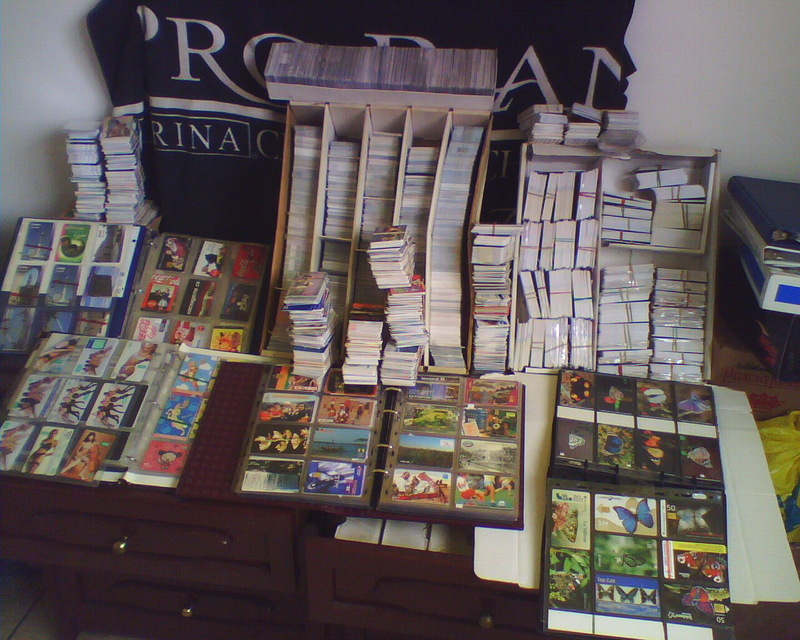 We started with small exchanges, 10 or 20 phone cards in total. They had more types of cards than I did but I gave more of the same type and they accepted. That's how I got to have more phone cards. What interests you most about your collection? 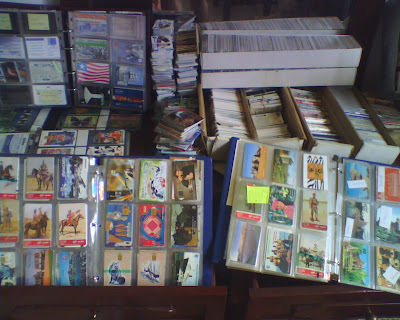 What interest me most about my collection are cards with themes such as butterflies, Disney, orchids, antiques, puzzles, zodiac sign and cards. From difficult countries, countries that you cannot easily get their cards – AW, such as in Africa, the theme isn't important. I believe it's most important to have at least one card from each country. When and how did you get to know Colnect? I learnt about Colnect during 2004, when it was still called Islands Phonecards Database, but I only registered in 2005. I made many exchanges, but friends asked me to add the cards I have in my collection, but I didn't know how it worked until I started learning little by little. I have actually swapped with many friends from Colnect. How much time do you spend using Colnect? Sometimes 2 hours a day and sometimes 5 hours. When I don't work spend, 6 hours. When I work, perhaps one hour. How many swaps / exchanges do you do on Colnect every month? In the month I've done most, I have done 53. It's the most I've done. Of course I do many swaps with the same friends. I have friends with whom I've actually done more than 20 swaps. I currently have 63 letters on the way to friends in different countries. Do you swap outside Colnect? Yes, I do swap outside Colnect. Many people I've invited to become a member on Colnect don't want to place what they have on Colnect. What do you like best about Colnect? What I like most about Colnect is that it's very original and very good. The best in the collecting world is that one shares a part of his life with friends from around the world. Colnect is extraordinary. What would you like to see improved on Colnect? Well, I would like that a person that has 3 negative ratings and doesn't respond to messages would be suspended. For example I have a few collector friends that have sent me cards in very bad condition. So bad that even I wouldn’t send them as a gift. I don't rate them neutral because they would immediately give me a neutral rating and say that what I sent was also bad. I can only choose not to swap with those again. Colnect has a very good community manager (Ignacio F Vico López [iflvicol]). He is a great friend that answers all your complaints almost immediately. He is a good mediator and I thank him very much for all he has done for me personally and for other friends who have asked him. An excellent friend who everyday helps make Colnect the best in the world. How come you have no negative rating? The people who have given me negative ratings did so because they robbed me. I have given them a negative rating and so they returned a negative rating. Colnect helped a lot to fix the situation. There are people that send ordinary cards and receive them using registered mail but most of the ordinary cards disappear. One has to try to demand from the collector friends that no scratched cards would be sent. Thank God these norms are common on Colnect. How can we improve the ratings system? That's a very important question. There are collectors who give a positive rating to a friend whose letter they received but they either sent a non-registered letter or didn't send anything at all. When much time passes and the other collector still don’t receive his letter and they don't answer his messages, he gives them a negative rating. Then they change their positive rating to a negative one without justification. It happened to me and it should not be allowed. It should be improved. First, both sides should be heard and then act because there are some collectors that take advantage of other collectors. I, in whatever I can do to help, will be happy to hear any idea. 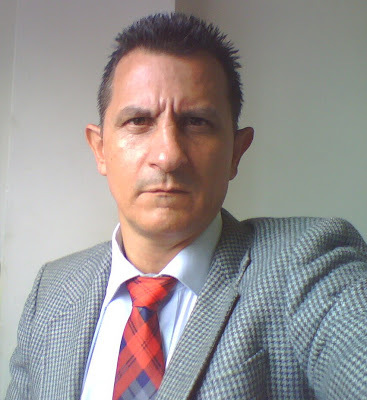 I thank you Amir for presenting this excellent website on behalf of all my collector friends from Venezuela and the whole world. As I know, they are proud to be members of this very special hobby. Many thanks. You have a friend in Venezuela and if you need anything from Venezuela, I'll be at your service. El colecciónista con las más positivas calificaciones en Colnect, el Sr. Ernesto Berrios, acaba de la marca de 313 + calificaciones positivas. Este logro es aún más increíble cuando te das cuenta de Venezuela ha tenido muchas problemas con su sistema de correo como ya se hemos informado. ¿Cuándo y cómo has empezado tu colección? Comencé mi colección en el año 1987 - 1988 aproximadamente, la empecé porque en Venezuela salieron unas tarjetas magnéticas de varios montos y colores y hacia llaveros y luego las empecé a guardar porque me llamo la curiosidad mucho. Luego conocí algunos amigos de Europa, como España y Francia que viajaban a Venezuela y les pregunte por las tarjetas y empezamos hacer cambios, eran pocas, cambiamos 10, 20 tarjetas ellos tenían mas modelos que yo pero yo le entregaba varias del mismo modelo y ellos aceptaban y así fue como fui guardando las tarjetas. ¿Qué es lo que más te interesa en tu colección? ¿Cuándo y cómo has encontrado a Colnect? Encontré Colnect en el año 2004 como telecard island pero me inscribí en el 2005 hacia muchos intercambios pero los amigos me decían ponga las tarjetas que tienes pero no sabía cómo era el sistema hasta que fui aprendiendo poco a poco he cambiado con muchos amigos en Colnect actualmente. ¿Cuánto tiempo pasas usando Colnect? Uso Colnect a veces 2 horas al día, a veces 5 horas, cuando no trabajo gasto unas 6 horas, cuando trabajo una hora al día. ¿Cuantos intercambios haces con Colnect por mes? El mes que más he hecho, he hecho 53, es lo máximo que he hecho, claro hago muchos cambios con los mismos amigos porque tengo amigos con los cuales he hecho más de 20 cambios. Actualmente tengo 63 cartas en camino para amigos en diferentes países. ¿Haces intercambios fuera de Colnect? Sí, hago cambios fuera de Colnect. Mucha gente que he invitado a que sea miembro de Colnect y no han querido no les gusta colocar lo que tienen en Colnect. ¿Qué es lo que más te gusta en Colnect? Todo, es muy original, muy bueno, es lo mejor en el mundo del coleccionismo. Uno pasa parte de su vida compartiendo con amigos de todo el mundo. Colnect es algo extraordinario. ¿Qué quisieras ver mejorado en Colnect? Bueno me gustaría que a una persona que tenga 3 negativos y no responda los mensajes fuese suspendida. Un ejemplo, yo tengo algunos amigos coleccionistas que me han enviado tarjetas en muy malas condiciones, tan malas que a mí me da pena hasta enviarlas como regaloy no los califico neutral porque de inmediato me califican neutral ydicen que lo que yo le envié también es malo, solo no vuelvo a cambiar con ellos. Colnect tiene un buen coordinador, el amigo (Ignacio F López Vico). Es un gran amigo que te responde todas las quejas casi de inmediato, es un buen mediador y yo le agradezco mucho todo lo que ha hecho por mi persona y por todos los amigos que le han pedido ayuda. Un excelente amigo que hace que cada día Colnect sea mejor. ¿Porqué no tienes ninguna valoración negativa? Las personas que en alguna ocasión me la pusieron mala fue porque ellos me robaron y como los califique negativos también lo hicieron y Colnect ayudo mucho a que eso se arreglara. Hay personas que envían cartas ordinarias y las reciben certificadas y la mayoría de cartas ordinarias se pierden, hay que tratar de exigirle a los amigos coleccionistas que las cartas en mal estado no sirven en Colnect. Gracias a Dios existe esas normas. ¿Cómo podemos mejorar el sistema de valoraciones? Esa pregunta es muy importante. Hay coleccionistas que hacen una valoración positiva a un amigo del cual ha recibido la carta y si la persona envió la carta ordinaria o no la envió y paso mucho tiempo y el coleccionista no responde los mensajes, ni llega la carta la otra persona que no le ha llegado la carta se cansa y le hace una calificación negativa este señor, el cual si recibió la carta pero cambia la valoración de positiva a negativa, a mi me ha sucedido y eso no se debe permitir eso hay que mejorarlo eso no se debe permitir primero hay que escuchar las 2 partes y luego actuar porque hay algunos coleccionistas que se aprovechan de otros coleccionistas. Yo en lo que pueda ayudarlos estaré a orden para cualquier idea. Agradezco a usted que representa esta excelente pagina en nombre detodos mis amigos coleccionistas de Venezuela y del mundo que como yose sienten orgullosos de ser miembros de este hobby tan especial. Mil gracias y que vivas por siempre. En Venezuela tienes un amigo y si necesitas algo de Venezuela estaré a la orden. Mil gracias de nuevo por existir. We are doing our best to stop cheaters from being on Colnect. We deactivate accounts of suspicious collectors and publish their mailing address on our "Warnings and Ratings Forum". We've just deactivated accounts of a sophisticated cheater (see below). We can do a good job at it only with your help. If you become suspicious of someone trying to be a wrong doer, don't hesitate to give us the information you have and we'll investigate. !MOST IMPORTANT! Please carefully read our Swapping Tips and follow them. The account of alispilfo has been deactivated although no negative ratings were seen on the profile page. This is a special case and the results of my own investigation are presented here. It seems the person has opened other accounts on Colnect, such as Thiago00 and marior. The account Thiago00 has been deactivated some time ago upon the person's own request. Later, negative ratings were given and collectors got angry claiming they have been cheated. modj0 has been deactivated when we realized it's the same address. marior has been deactivated as emails used by that member were reported as suspicious in other forums. Considering the fact it's the same person (this has taken some investigation and cross referencing information from different sources) , it seems opening the other accounts were meant for cheating while keeping the main account "clean". *Shipping addresses saved on Colnect system. Meet one of Colnect's most notable contributors and the creator and coordinator of the world's most extensive tea bag catalog, Carine de Pauw [crookscarine]. As her Colnect profile shows, Carine is a serious collector of stamps, phone cards, tea bags and beer mats. She has been a Colnect member since 2005, when Colnect was still a website only catering to phone card collectors. Carine has just celebrated her birthday and we thought it would be a good time to feature her on Colnect's blog and ask her a few questions. When and how did you begin collecting in general and tea bags specifically? I've started to collect stamps during my childhood. Now I have other collections as well, of which the most important ones are phone cards and teabags. Our daughter began collecting teabags in 1996. She didn't have enough time so I took it over. I'm always looking for new items for all my collections. Luckily I have a lot of good friends and relatives who are helping me. Every time they are going on holidays, they come back with new collectibles I can add to my collections. How and why did you start tea bag category on Colnect? As I knew many people who collected teabags, I've asked Amir [tcawe] to start a tea bag category on Colnect. He was happy to add the new category and I became the coordinator of the tea bags catalog in August 2009. Now I post scans of my own teabags and of the ones I receive from the other members. For the time being we are with 150 tea bag collectors. The catalog shows 13,236 teabags from 1,139 brands and out of 75 different countries. How often do you use Colnect? I'm now using the site on a daily basis to manage my swaps and to add new tea bags to our tea bag catalog. Colnect is perfect. You can reach many collectors from all over the world. Of course new members are more than welcome. The more members we have, the bigger our teabag collection will be, and the more possibility we have to exchange. Last but not least I would like to thank Amir for all the work he's doing.